I had planned to do one final census this morning but 70+ km/hr winds dissuaded me. Barry left around 9:00am and shortly afterwards two large dead trees fell across the driveway! Luckily P.M. Peter Shaughnessy was able to come by and cut them up with his chainsaw. 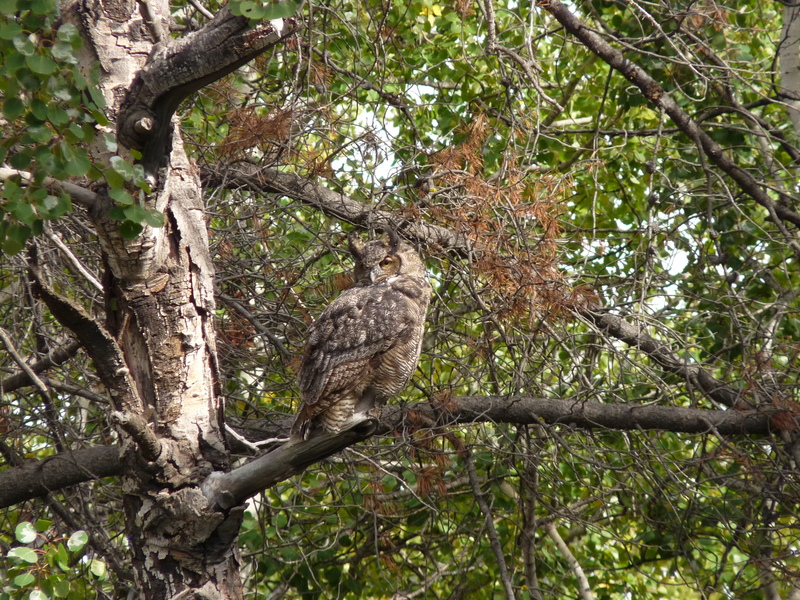 On my way out of the valley I flushed up a nice Great Horned Owl that posed for some pics. So that’s all for now folks, tune next August for more on our bird migration coverage here in the Chilcotin! Thanks to everyone who helped to make this such a good year (despite the low capture tally!) especially Barry Lancaster, Peter and Roma Shaughnessy, Andrew Harcombe and all of our volunteers throughout season, we couldn’t have done it without you! Slightly better weather this morning but no change in the water levels. Barry and I completed a very productive census, noting 27 species and adding another 7 species on the walk back to the lab. Lots of birds were moving, and with fairly strong winds from the southwest and rain visible down the lake, many birds were moving across the valley heading east. Whether they were continuing south along the eastern slopes of continuing eastward we couldn’t tell. On the pond that was once a field there were no waterfowl but 2 juv. Red-necked Pahalaropes were foraging in the margins closest us. They took off and re-alighted a couple times offering decent looks both on the water and overhead and the even called for us! I believe this represents TLBOs 2nd record of RNPH. Throughout census we had large volumes of birds passing overhead. The big numbers were Yellow-rumped Warblers (318), Varied Thrush (82), American Robin (63), American Pipit (60) and Pine Siskin (57). It was particularly neat seeing flocks (!) of Varied Thrush passing over, often with American Robins but many times in mono-specific groups. In with the Yellow-rumpeds we picked out single Wilson’s, Orange-crowned and Townsend’s Warblers long with a few other odds and ends such as Red-breasted Nuthatch, Ruby-crowned Kinglets and a lone Townsend’s Solitaire, our first in weeks. Golden-crowned Kinglets were more prevalent today than usual with a couple small groups on census. A couple groups of waterfowl were seen flying about though only American Wigeon and Mallard appeared to be in attendance. Barry also spotted 2 Common Loons passing over. A lone Merlin seemed to be enjoying itself as it wielded about and at least 3 different Bald Eagles were around, 2 imm. and 1 adult. Well, it’s official now. With more rain over-night the water levels rose to the point that every net had water under it, whether an inch (in the case of Net 1) or 3 feet (in the case of net 6) !!! With more rain in the forecast for tonight and wind predicted for the following couple days, Barry and I spent the morning taking down the nets and packing up the station. It is dissappointing to be packing up so early, for the second year in a row no less (! ), but you can’t argue with mother nature. Winds started picking up as the morning progressed but high numbers of birds were passing over for the first few hours of the morning. We noted a total of 148 American Pipits, 160 Yellow-rumped Warblers and 96 pine Siskins. I also had a string of 5 Northern Flickers fly over, probably the first instance of obvious flicker movement I have seen in BC. The flooded field attracted some waterfowl, as it did last year. 4 American Wigeon took flight as we pulled up to the station and 8 Green-winged Teal dabbled in the shallows. A late-ish American Kestrel was seen on a wire just after census and 2 Northern Harriers were perusing the open areas. Apparently last year’s end of September weather was no anomaly. Our long-term readers (inter-annual recaptures in banding lingo) will remember that last year on Sept. 26 we were flooded out and couldn’t re-open nets for the remainder of the season. Well, after 24hrs of rain we have now experienced basically the same phenomenon, although to a slightly lesser extent. While last year the water came right to the banding lab and every net had water under it, this year the water starts at net 6 where a 2m wide torrent rushes across the track. This means that we have 3 nets that are currently usable. If the water drops a bit we should be able to use 15 as well. However, for the rest of the nets my hunch is that we will be unable to take them down at the end of the season without hip-waders to cross the deepest parts of the trail. Chris, with his impeccable timing, took off yesterday for a teaching job in Portland so the Okanagan’s Barry Lancaster has come up to fill his shoes til the end of the season. Regrettably, it looks as if his presence and abilities may not be required. Still and all, as with last years bad weather, it has brought some interesting birds in and today we recorded two new species for the TLBO list! On census I had a Western Grebe at the north end of the lake and upon returning to the station Barry informed me that he had had a juv. Western Sandpiper in the wet margins of the flooded field! Not bad for 2 hours work! Birds were quite active despite the poor weather and I recorded a surprisingly high 29 spp. on census. Nothing out of the ordinary, excepting the Grebe, but Red-tailed Hawk, Varied Thrush and both Common and Hooded Mergansers were all nice as they are infrequently recorded species on the census route here. Environment Canada is calling for slightly better weather tomorrow so hopefully we will be able to get a few nets open and with any luck there will still be large numbers of birds around to take advantage of them. Or vice versa. Sept. 23 – Water Spout! Another spate of bad weather, this one the worst of the season. 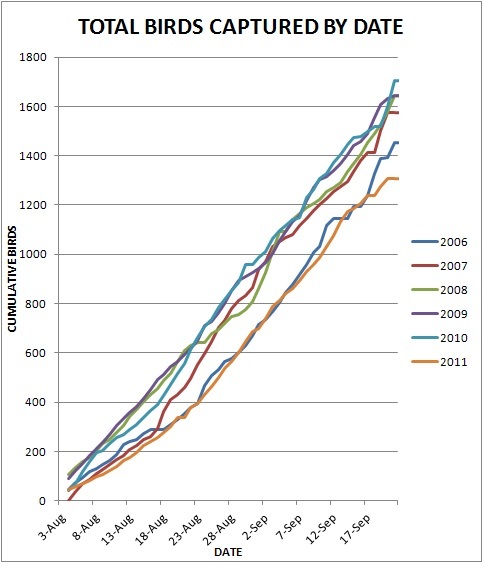 Winds gusting to 70km/hr over-night resulted in more blown-down trees on census than birds! A few birds were still about despite the state of the valley and I managed to record 12 species between census and the walk back to the lab. over, facing south but heading in a north-easterly direction. With the high winds from the south I decided to do a bit of a lake watch, as anything on the lake would probably, sooner or later get blown to the north end. As soon as I arrived the wind whipped up a min-water spout (maybe 8 feet high?). Unfortunately, shortly after that the winds quieted down and started to shift to northerlies! Curse it. Consolation: I went home and baked 2 dozen BCCMs (Banana Chocolate Chip Muffins), the undoubted highlight of the morning! It has now settled in to a steady rain, reminiscent of Vancouver in February. Finger’s crossed for better weather tomorrow. 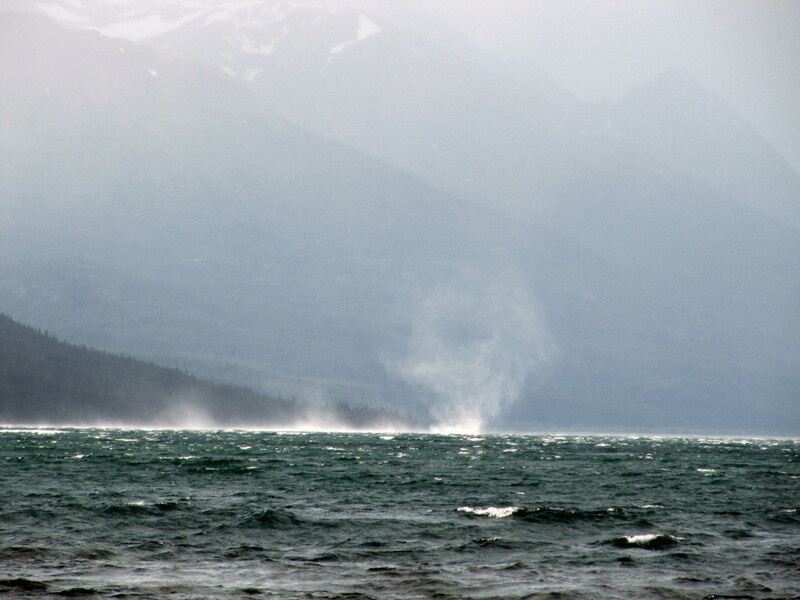 Here's a shot of one of the water spouts on the lake this morning. A mini-fallout of birds around the station today, especially right around the lab where dozens of American Robins, Cedar Waxwings, Yellow-rumped Warblers and Sparrows of 5 species made for a veritable hive of activity for the first half the morning. Most the species where attracted by the abundance of berries near nets 1 and 13. Red-osier Dogwood, wild raspberry and saskatoons make for a feast if your a frugivorous bird. A flock of Evening Grosbeaks joined the fray for a while and in the undergrowth many Ruby-crowned Kinglets, Black-capped Chickadees and the odd Wilson’s Warbler and Warbling Vireo foraged in the shrubbery. Hairy and Downy Woodpeckers and numerous Northern Flickers (I saw at least one that had very yellow wings, a definite integrade) quietly joined the other berry-eaters, especially at the Red-osier Dogwood. Due to the on and off light rain for most of the morning we ran just 2 nets – 1 and 13. Being the two closest to the lab we could check them every 10 minutes to avoid the birds getting wet. Impressively, we still managed to band 26 birds. Too bad we couldn’t get more net hours as it clearly could have been a 50+ day with more nets open. C’est la vie. Our 4th Hermit Thrush of the season was one of our first catches of the morning. It was a good day all-in-all for thrushes as we also caught a late Swainson’s Thrush and 2 American Robins, our 2nd and 3rd for the year. The catch of the day (I suppose) was our 1st Pacific Wren of the season. 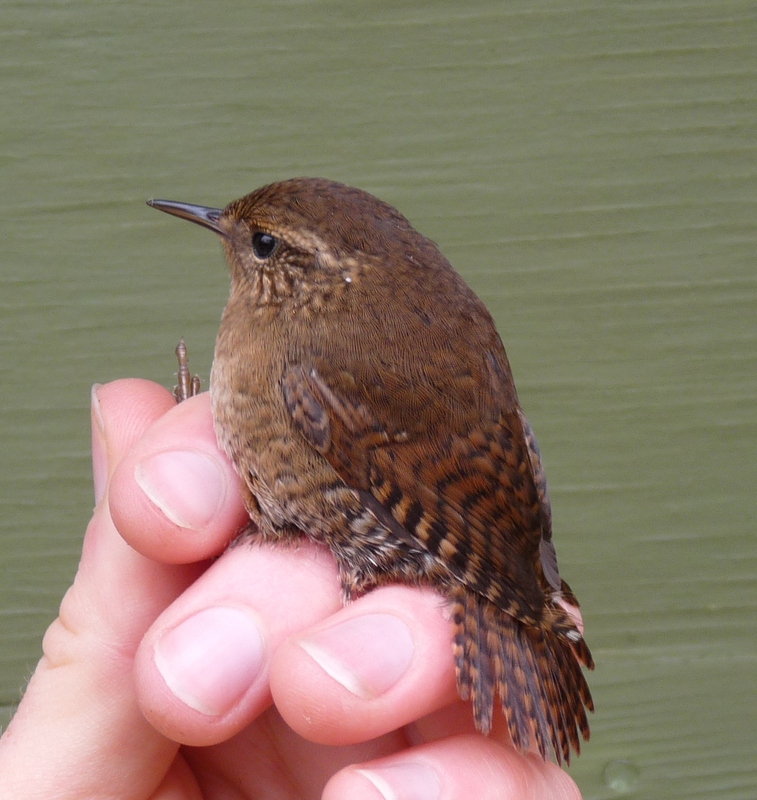 There are many great things about banding here in the scenic Tatlayoko Valley but one of the very best is that we don’t catch many wrens. All you banders out there know exactly what I mean! This particular individual was actually fairly well behaved. Granted, I knew this must be a remarkable individual when I saw it caught in the third from bottom panel of the net! Extraordinary as these skulkers are almost always in the bottom panel and spun around so many times that you wonder how they’ve managed to keep their breakfast down. Pacific Wren- don't let it's diminutive stature and "cute" demeanour fool you! Census was fairly uneventful, once I got past all the aforementioned activity in the first 15 minutes of the route. On the lagoon were 4 American Wigeon and at the north end of the lake I watched a Sharp-shinned Hawk give half-hearted chase to a much larger Pileated Woodpecker. As I started back to the station the “Pilly” was feeding beside the road on the much-fancied Red-osier Dogwood and let me pass within metres of it. Incredible birds! Honourable mentions go to a Cooper’s Hawk that Chris had early on and a flock of 11 Amican Pipits that passed over around noon. Two late Dusky Flycatchers were ET’ed as well, one in the nets and an un-banded bird seen foraging near the lab. PS, Only one person guessed on Quiz 5.0 but Chris Siddle, you got it bang on! Both birds were hybrid Yellow-rumped Warblers though they are both obviously pretty close to being pure with the bird on the left being an Audubon’s type and the right-hand bird, a Myrtle type. The “Audubon’s” individual shows a bit of white feathering around the outer edges of the yellow throat and slightly paler lores, the “Myrtle” shows a few pale yellow feathers in the throat and virtually no eyestripe just slightly paler lores, as in the other bird. All of these traits point towards hybridism somewhere back in these birds’ respective lineages. Another day of very strong winds have prevented us from opening the nets once more. A couple of days ago I was dreaming of a weather day to catch up on sleep, now I’ve got my sleep and wish they would go away. The forecast is for a couple more weather days before the end of the season, and that is not going to help us at all to avoid finishing the season with by far the lowest banding total ever for TLBO. We presently sit at just 1308 birds banded this season, and it is starting to look like we will be lucky to reach 1400 by its end. Today I snuck out for a quick census as that is all we can do in this weather. With the weather as it was I was hoping to reach just six species, I reached what I will call 6.5 species so will consider that a success. I say 6.5 because I had a duck (of an undetermined species) fly over me going North at about the speed of light. I doubt many ducks have ever flown faster than this one. I was unable to determine what species it was, but as it was the only duck I saw it was a new species regardless. The only highlight on census was a Pacific-slope Flycatcher hanging around with a fairly large flock or Yellow-rumped Warblers. It is an odd time, and unfortunately circumstances for a Pacific-Slope Flycatcher to still be in the area. This may be my last blog post as I am being summoned back to Portland State University to teach a lab. I have hired Barry Lancaster to fill my shoes. Hopefully Avery can twist his arm into writing the blog a couple times, might be nice to have a different voice on here.